"Funk bandleader Boobie Knight specialized in a heavy, psychedelic-tinged, guitar-centered brand of groove, something along the lines of the proverbial stoned soul picnic. 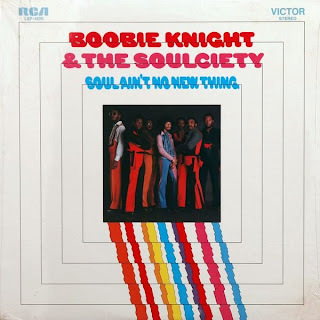 Dubbing his first outfit the Soulciety, Knight landed a deal with RCA and recorded the album Soul Ain't No New Thing in 1972; it included jam-oriented tracks like "King of the Real Good Guys," "Power to the People," and the title cut. Moving over to Brunswick, Knight reorganized the band and renamed it the Universal Lady, taking on Al Johnson as lead vocalist. 1974's Boobie Knight & the Universal Lady expanded on the trippy vibes of the debut, with key cuts including "Earth Creature" and the oft-compiled "The Lovomaniacs." Knight's two albums are now considered collector's items among die-hard funk aficionados." I love this stuff - thank you! thanx again...you're a much welcomed blogger in my house!